"Sampath Speaking" - the thoughts of an Insurer from Thiruvallikkeni: Want Railway Season Ticket - give Undertaking not to commit any Offence !!!! 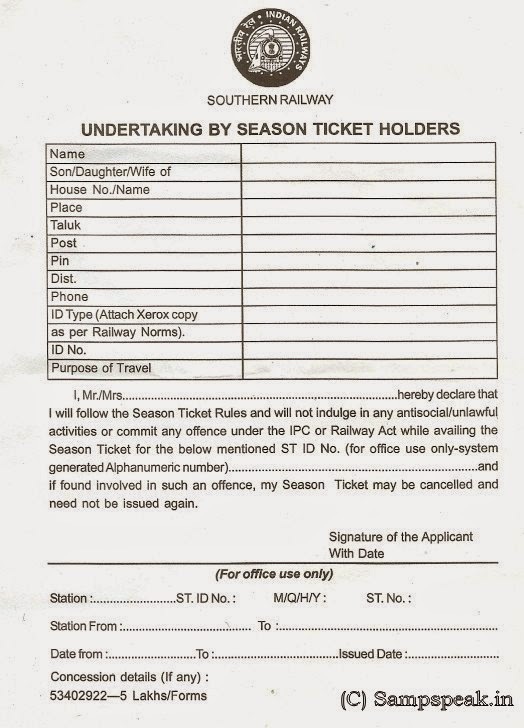 Want Railway Season Ticket - give Undertaking not to commit any Offence !!!! Do you live in a Metropolis … travel by train … buy season ticket – then here is something for you….. most of my friends hush and puff to catch the train – and suddenly realise that it is time to renew their monthly pass …. Some even realising that it was valid only till yesterday or a day before – might even get down at the next station, walk to the counter to renew the pass for another month ………..
Intrigued by the form – here is something extracted from Season Ticket Rules of Railways effective May 2007. Season tickets are issued for suburban as well as non-suburban sections. Fares for Second Class MST is equivalent to the fares for 15 single journeys by second class (Ordinary) uniformly for all distances. Fares for First class MST continues to be four times the Second Class MST fares. Season tickets to children are issued at half of the adult season ticket fare. Quarterly Season tickets are charged at 2.7 times of the normal adult/child MST fare. Season tickets are issued for First and Second classes only and these tickets are valid in the class for which they are issued. Only one season ticket is issued to a passenger to travel between the stations serving his place of residence and place of work/studies. If the passenger is found with more than one season ticket to flout the distance limits, the additional season ticket will be treated as invalid. 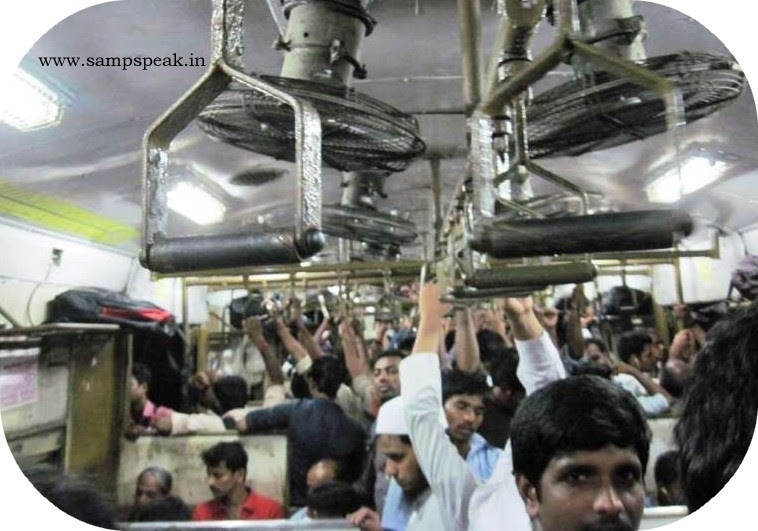 First class season ticket holders are not allowed to travel in AC coaches. Season tickets are issued upto 150 Kms. only. The rules state that a photo Identity Card, alongwith a plastic cover, is issued to every season ticket holder at a nominal cost. In addition to above, the Identity Card, Pan Card, Passport, Driving Licence, Voter Identity Card and Credit Card issued with photograph by any Government in India or some Government agency in India, will also be accepted as proof of identity for issue and renewal of season tickets. Season tickets are not valid for travel in reserved coaches and trains. Season ticket can be renewed 10 days in advance of the date of expiry. In such cases, it will be made valid only after the date of expiry and not from the date of renewal.